Energy efficiency in Data Centers is nowadays a major challenge because of its economic and environmental impact. The GreenLSI team is part of the Integrated Systems Laboratory (LSI) Research Group of the Electronic Engineering Dpt. at Universidad Politécnica de Madrid (Spain). Our research focuses on Energy Optimization in Data Centers. We have developed a global strategy to allow the usage of multiple information sources to coordinate decisions to cut the total energy consumption. 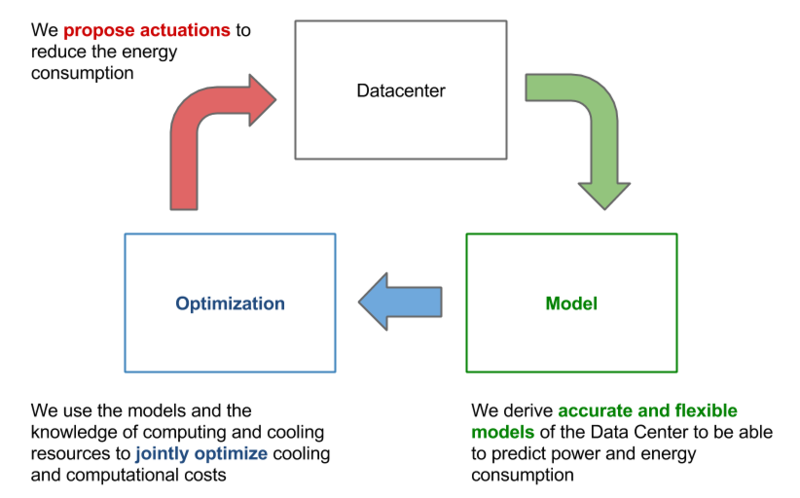 The optimization system uses the available knowledge about the energy demand characteristics of the applications, and characteristics of computing and cooling resources to carry out proactive optimization techniques. Our framework takes as input all the information gathered from the Data Center. The system stores data and generates knowledge that can be used to run energy optimizations at different levels of abstraction (i.e. at the resource manager level, at the architecture, compiler, etc.). Optimizations use power models trained with real data obtained from the Data Center. Results of these optimizations are evaluated by a decision-making system, which finally proposes decisions to be executed back to the Data Center.